Earlier today, 6Sense announced a $20MM round of funding led by Bain Capital Ventures. This is the story of why we invested. When was the last time you went to a restaurant without checking Yelp (founded 2004)? Or booked a hotel without checking TripAdvisor (founded 2000)? Or bought something online without reading customer reviews (likely powered by BazaarVoice, founded 2005)? A generation of business decision-makers has grown up in that world. 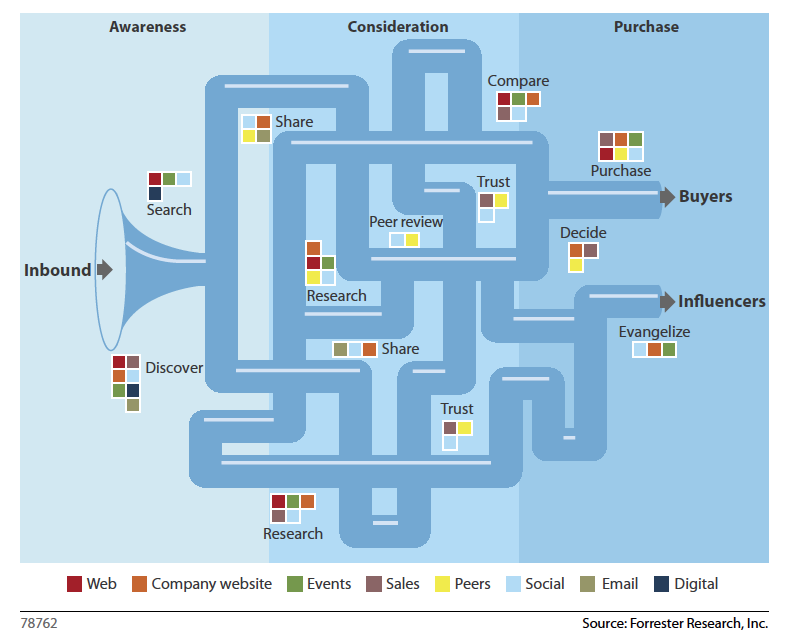 So why would B2B buyer behavior be any different? We’ve all seen the incredible proliferation of marketing technology tools, with close to 1,900 vendors vying for CMO attention. But the vast majority of these are about instrumentation and optimization of the minority of the buyer journey – your own web site. What about the other two-thirds? That is probably the biggest unanswered question in B2B marketing and sales today. Our search for transformative solutions to this problem led BCV to Amanda Kahlow, Viral Bajaria and the 6sense team. Their proprietary “Buyer Intent Network” captures time-based buyer behavioral data from thousands of sources (search engines, industry trade publications, blogs, forums, etc.). That means 6sense is the only predictive marketing and sales solution that sees the entire buyer journey. What if marketing and sales leaders could detect when a specific buyer is truly in-market, ensuring hyper-focused engagement of the right accounts by a sales team and better customer experience for the prospect? 6sense users see 9X higher marketing-to-sales qualified lead conversions, with 2/3rd fewer sales touches to convert leads to opportunities. Think of the magnitude of that performance gain and what it represents in cost savings and sales productivity at enterprise scale. That’s why companies like Cisco, Dell, VMware, NetSuite, Lenovo and many others use 6sense. From a technology back-end perspective, 6sense shares the deep data science and machine learning DNA of several other amazing SaaS companies in the Bain Capital Ventures family, including BloomReach, Gainsight, Clari and Captora. Within their respective categories, each of these products automates (a) the extraction of insight and (b) the injection of actionable to-dos into existing workflows (e.g., CRM systems). That combination is incredibly impactful for enterprise customers, as borne out by the growth rates of each of these companies. Of course, great companies and technologies are forged by great people. Amanda (CEO) has an incredible personal story and is a true domain expert, having spent over a decade running a services business around cross-channel big data marketing tech infrastructure. Viral (CTO) was the architect behind the original Hadoop infrastructure at Hulu. Mark (CSO) was a co-founder at Bizo, which was recently acquired by LinkedIn. This is a seasoned, talented team and we feel fortunate to support them in their mission to transform B2B marketing and sales. Posted on February 19, 2015, in Uncategorized and tagged Bain Capital Ventures, Big Data, Big Data Applications, Cloud Marketing, Fundraising, Marketing Software, SaaS, Software-as-a-Service. Bookmark the permalink. Leave a comment.